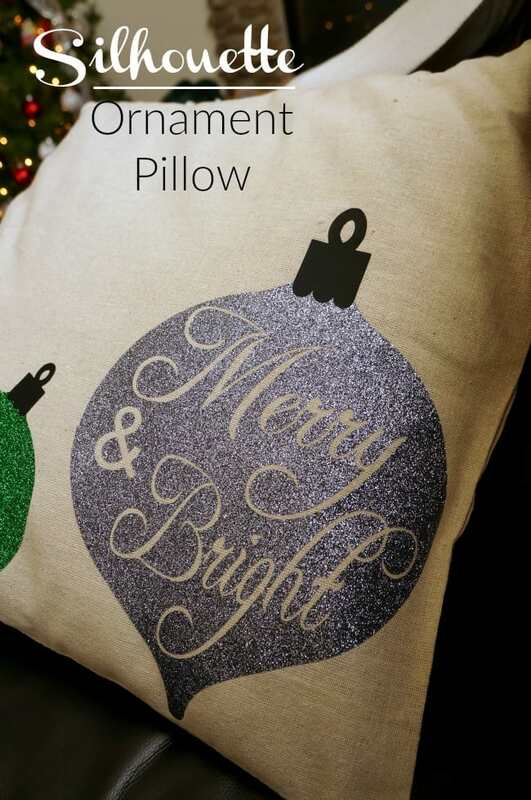 It’s a big day friends, I’m sharing a festive pillow project along with holiday projects from 28 of my very best blogging friends. PLUS we have an amazing Silhouette giveaway for you. Lots to read so get comfy and let’s go! I have a thing for pillows, I have made quite a few with my Silhouette. I use pillow covers so I can easily change them up with season and holiday. I used a few ornament designs from the SIlhouette store to design this pillow. I manipulated each one a bit to fit the size of my pillow, and added Merry and Bright to the center of one. Once I had my design just right I mirrored the image and cut each ornament from glitter HTV. It is so important to mirror any images and text when using HTV because you will be cutting from the back of the vinyl. Once cut I weeded my pieces and laid them out on the pillow. I laid a tea towel over the top and ironed on each ornament one at a time. I pressed firmly for a minute or so to ensure a good stick. Then I went back and ironed on the black ornament tops. Once everything was cool and adhered I turned the pillowcase inside out and and ironed from the back just a bit to help it really stay in place. 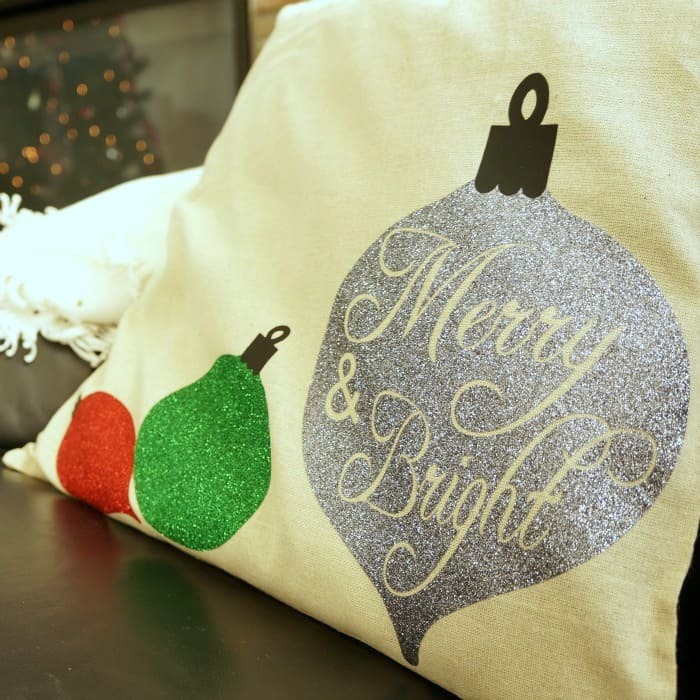 This pillow is perfect for the season and adds a fun touch to my living room. Want to Check Out More Holiday Silhouette Projects? And I’ve saved the best for last. My Silhouette Challenge buddies and I, in partnership with Silhouette America , are hosting a mega-huge giveaway for not one, not two, but three winners! First prize: Silhouette Cameo Machine +50 bonus designs. $349.49 value. This is a fabulous idea. 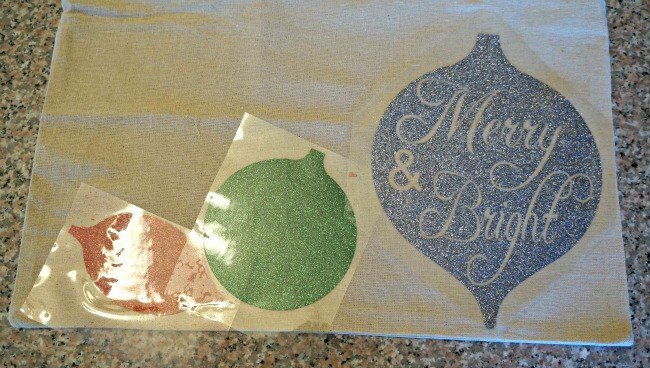 Love the design and the glitter HTV. This is very fun and love those glitter!